In 2011, we chose oak sedge to be our first "Plant of the Year." It forms dense clumps of narrow "grass" blades. With the blades arching low over the soil, the plants seldom reach over 4 or 5 inches high, but can easily be 14 to 18 inches across. 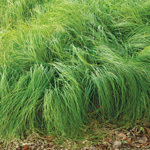 Oak sedge grows best in areas receiving some shade every day, preferably afternoon shade. While the plants will grow well in three hours of afternoon sun, their leaves may turn more yellowish green. Plants not in afternoon sun should be a lush green. 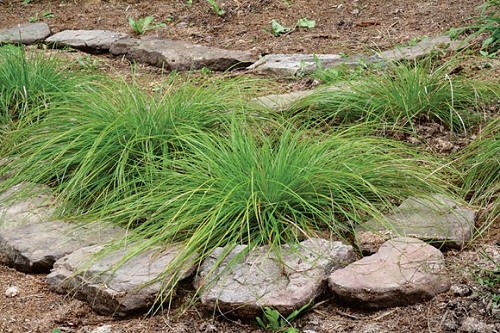 Don't feel obligated to water oak sedge daily or weekly. It is native to partially shaded ridge tops where soil moisture and fertility are low. In a garden setting, oak sedge will grow well in soil that has been amended heavily for other plants, but it doesn't like constantly wet feet. Native forest wildflowers and oak sedge will enjoy a thorough soaking about every 10 to 14 days during a summer dry spell. Oak sedge is green from late March through most of October. 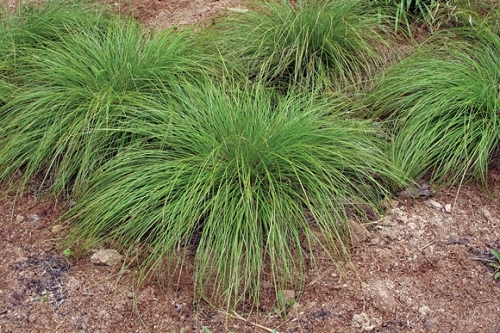 It keeps its shape with light brown foliage through winter. Cut it back to 1 or 2 inches in late February or early March. Oak sedge makes a wonderful groundcover plant for a mass planting. It can function as a green mulch when planted between other, larger plants. 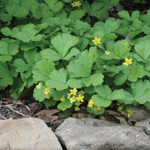 It can also be used as a border for the edges of shady beds. We've enjoyed using it as a stand-alone container specimen. Q: do you ever carry oak sedge seeds? I'd like to use it over a wide shaded area, and the plants will be more expensive than I can afford. A: Very rarely and none for sale right now. This year we only collected enough to sow for our own plant production.